Is there some sort of paint remover available to the public that you could soak small parts in and get it down to bare metal. I'm thinking hubcaps, misc. small painted trim pieces, radio deletes ... stuff like that. Re: Removing paint from small parts? I end up stripping with the sand blaster on stuff like that. Paint remover some times, but most of the time at the very least finishing it off with the sand blaster. Now I don't have a sand blast cabinet, we are talking a bucket-o-sand kinda thing. Just blast out in the back yard. You can put up a little "cabinet" with a tarp over a table or something on top of concrete and blast under it then sweep up the sand and reuse. I have something like this only smaller. 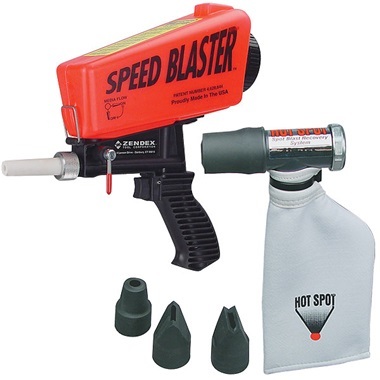 I also have a "Speed blaster" with the "Hot Spot" attachment allows you to sand blast small spots with virtually no sand flying out! A very valuable tool in my opinion. There's lots of brush-on paint removers available at home stores that will do small jobs easily. Plus you can buy in small quantities. Blasting is certainly the way to go for some stuff, but not everything. Removing painted details from polished trim pieces requires a chemical, not abrasion. Cleaning failing paint from emblems and such can sometimes be accomplished quickly with a shot of carb cleaner and a toothbrush. Last edited by nsb29; 03-23-2019 at 08:38 AM. A mixture of hydrochloric acid and water works nicely on rusty steel parts. Throw them in a plastic bucket and check in on them every so often. Rinse when done and paint or oil right away. Do not use for aluminum parts. They will dissolve. You are right to point that out, good catch! We are talking small parts, "hard" parts and small sheetmetal parts or things like floors and firewalls and stuff like that. 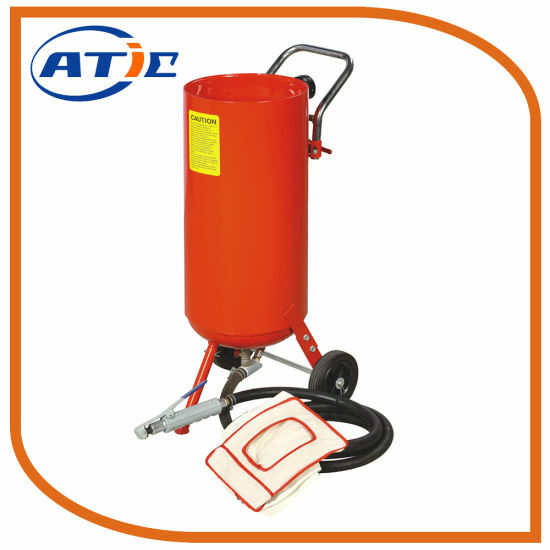 But DO NOT sand blast large panels like hoods and doors as they can warp VERY EASILY and very badly. Picture the sand as being millions of tiny hammers putting dents in the outer layer of metal! Good thing to make that perfectly clear. There used to be places around here that you could have entire bodys dipped and they come out bare metal when it was only paint being removed. I believe they still have them in Oregon, I know some of the restoration shops use them. I was thinking there must be a way to do small pieces at home. Im not talking rust removal, just a decent part that I want the paint stripped off of. I don't have a sand blast cabinet and wasn't wanting to purchase anything to blast. Ill check the home stores. I have heard of something called aircraft stripper that people brush on and then scrape off. I wonder if I can just put some in a metal container and drop the parts in that I want the paint to come off of? As you can tell I have pretty much no idea what Im talking about haha! The website is a little slim in the complete info department. Ill give them a shout next week sometime. Thanks for the heads up! The acid is available at pool stores or Home Depot and it’s sold under the name of “Muratic Acid”. The ratio is around 7:1 or 10:1 parts water vs acid. Oh sorry, I thought this was a formula for removing rust and scale, not for paint removal ... Thanks!